2016 Kawasaki Brute Force 650 4x4i. Picture credits - Kawasaki. Submit more pictures. Featuring a water-cooled V-twin engine tuned for muscular torque and effortless pulling power, the Brute Force 650 4x4i delivers legendary performance and value. The soft riding swingarm rear is matched by McPherson struts and IRS suspension up front that are able to cope with comfort. Ask questions Join the 16 Kawasaki Brute Force 650 4x4i discussion group or the general Kawasaki discussion group. Bikez has reestablished Bikez.info motorcycle web shop overview. Here we present the major online shopping possibilities for motorcycle parts, gear and accessories. This includes customizing and insurance. Search and compare products and prices. 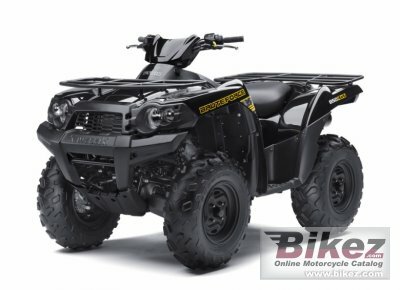 Try our 2016 Kawasaki Brute Force 650 4x4i discussion forum if you have questions or comments. Information about any technical issue is always welcome.